(CNN) – When a Washington state man was charged last year with unlawfully firing a shotgun, he had a simple explanation: Joe Biden told me to do it. The prosecuting attorney in the case against Jeffery Barton, 52, told CNN on Wednesday that the weapons count is out. He’ll now be charged with obstructing a law enforcement officer. In July 2013, Barton told a judge in Clark County that he thought people were trying to break into his car at his home so he fired his shotgun in the air to scare them off. "I did what Joe Biden told me to do," Barton told CNN affiliate KOIN. "I went outside and fired my shotgun in the air." 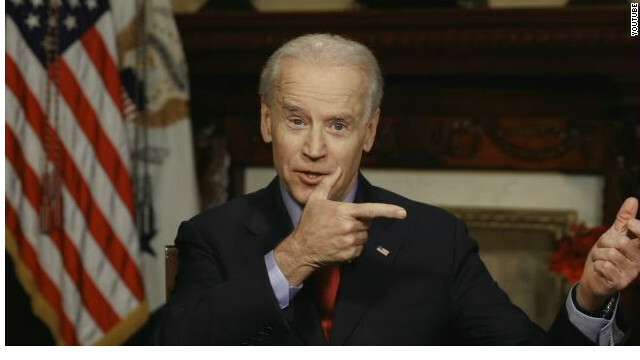 Biden did, in fact, tell people to fire a shotgun in the air if "there's ever a problem." At the height of the gun-control debate that followed the 2012 Newtown shooting, Biden said during an online question-and-answer session that "If you want to protect yourself, get a double-barreled shot gun." He added that he tells his wife, Jill, that "if there's ever a problem just walk out on the balcony here ... put that double-barreled shotgun and fire two blasts outside the house." His comments were likely intended to underscore the position that shotguns were sufficient for self-defense, rather than semi-automatic weapons. But Barton used the defense in his case. Tony Golick, the county's prosecuting attorney, told CNN that "the charge of unlawful discharge of a weapon will not be pursued" because from the outset it was a "close call." "We were concerned based on the facts of the case that a jury will not convict," Golick said. "The area that he discharged the fire arm in is a no shooting zone," the attorney said, adding though that people have the right to "protect their property as long as they use justifiable force." Golick's trial for misdemeanor obstruction is now set for October 24. @Dm40-WOW, you didn`t read my comments. I will do this slow for you. Warning shots against people bad anyplace anytime. Warning shots to scare off a wild animal ok in the country side where no one is likley to get hurt and bad in the city where the chance of someone getting hurt increases alot. This isn`t hard. @Rudy-Im not debating you on the methods you use to chase away a bear.... out in the woods. No fun,is it smith,when people take your posts literally. Didn't the officer who shot Brown miss a few of his shots, smith? If I'm not mistaken, a house (or two) had been hit by the officers stray bullets. Thank goodness a child wasn't injured or killed as well by this same officer's erratic shooting in a residential area that was, one assumes, filled with people going about their daily business. "However, if it is indeed correct that there are 2 per week, why should all the focus be there blaming someone else rather than rectifying another problem. Shouldn't we at least add that to the discussion?" I think we better start dealing with the cops killing 'the two per week' (if that is accurate, I will take you on your word) or we are going to be facing a lot more problems than just 'black on black' crime. You have to try and understand it from a black person's perspective... it was not that long ago we (yes, us) were hanging black men in the street for minor (or even made up) crimes with a mob mentality which included burning and maiming the body. All the 'good white folk' would stand around and get their photo taken grinning like a bunch of idiots and post cards would be made depicting this gruesome event (when ISIS does it, it is awful, but when we did, it was okay?!?) and sold at the drugstore on the corner. How do you think 'the black folk' felt about this? Are they just supposed to forget or pretend this didn't happen? Were I a black person and I saw what is going in on America today (in your face racism is as bad as I have seen it in three decades) I would be afraid. Fear can turn to anger and hopelessness... we had whole cities burn because of race riots before. You don't have to agree with me and you can deny it all you want, but many, many black people (and they wonder why they don't vote for them) sees the republicant party and faux news as waging a war against them (or at least trying to pick a fight)... Denying it doesn't mean it doesn't exsist... it exsists (I see it every day tom i, and Sniffit has tried to explain 'dog whistles' to you, but you want to deny it and pretend it doesn't exsist or make it about BOTH parties). "And the autopsy showed that he was shot in the front, not the back." You are not paying attention... the autopsy says "The autopsy couldn’t say, however, whether the unarmed teenager was retreating, charging or if he had his hands up when he was killed, a claim that has become a central rallying cry of protesters demanding justice in cities across the United States."